SNOW SNOW SNOW SNOW!!!! Check out our picks for the best sledding spots all over the good old RVA. Have fun (and be sure to wear your mittens)! It’s happened to him, to her, and to you. A moment so silly, so juvenile, yet so undeniably human: contagious laughter. This week, our guide to all that is proper tackles an interesting topic–what do we do when we can’t stop laughing. 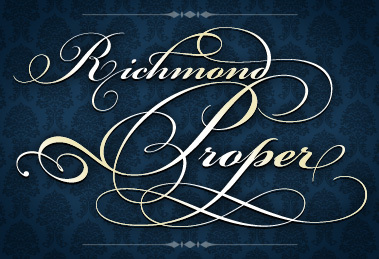 It’s been another banner year here at Richmond Proper. We’ve examined everything from street harassment, to proper condolences, to cycling, to parenting during these past twelve months. Let’s wrap it up with a year-end collection of etiquette thoughts from seasoned professionals and tween bloggers alike. This week’s Richmond Proper answers what to do when you catch your friend cheating on their partner, and how do you turn down a request for second date when the first didn’t go so well. We all know that Richmond Proper adores order and exhorts her readers to live as peaceful an existence as possible. But this week, as a sort of rebellion perhaps, I’ll address the subject of…rebellion. With the holidays fast approaching, we thought it would be a good idea to take down the the tome that is our on-going Richmond Proper article, blow away the digital dust, and look over some hard-and-fast rules to make the holidays more mannerly. For instance, what’s the best way to set the table before dinner, and how should we interact with family members that we’d like nothing more than to punch in the face. This installment’s question certainly strikes me as particularly Richmond-relevant. Tumblr user Sofisopaipilla asked: I’m hosting a vegan potluck, is it out of the question, crass, rude, icky to ask people to bring a meat-free dish to share? Someone once said that if you really want to make the world a kinder place, require that all people work one full year in retail. That way people get to see first hand how unmannered and rude people can really be, thus inspiring workers to go into the world with a more munificent demeanor. Unfortunately, that won’t happen. Luckily, we have Richmond Proper to right our wrongs. I don’t make it out to Carytown much anymore, being an East Ender now, but the last two times I was there I witnessed some pretty egregious etiquette blunders on the same block of Cary Street. You know the one — Cary Court, Can Can, Sweet Frog, etc.